1988 Coupe. 25,205 original miles. 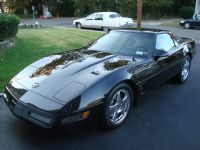 Posts: 1 Does anyone know if Pennzoil SAE 5W-30 oil with API Service SN can be used in place of the original SAE 5W-30 oil with API Service SF/CC in a 1988 Corvette? Posts: 2 As far as I know Pennzoil can be used in anything. Look on their website and it will tell you everything you need to know. I believe the new oils are better than the old ones. Posts: 150 Been using Pennzoil in my 88 for a long time. No issues. 1996 Black Cpe., Lt. Beige Int., LT4, 6 Spd., Corsa Exh., K & N, & Chrome Replc. Wheels. Posts: 48 Like russ1953 said, the answer is yes regardless of brand of oil.